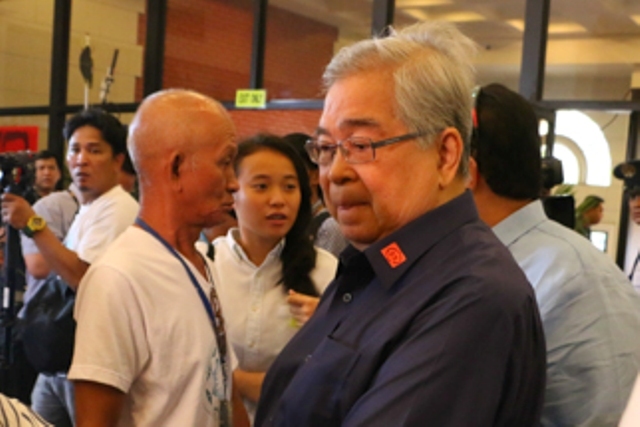 MANILA, Philippines — Former Presidential Commission on Good Government chairman Camilo Sabio has filed a petition at the Supreme Court challenged his graft conviction over allegedly anomalous car lease deals with a bank. In his 26-page petition for certiorari filed before the SC En Banc, Sabio said the Sandiganbayan First Division erred in its June 22, 2017 decision finding him guilty of two counts of graft and sentencing him to a minimum of 12 years to a maximum of 20 years of imprisonment for both cases. The First Division also ordered his perpetual disqualification from holding public office. Filed by the Ombudsman in 2012, the graft cases stemmed from the two contracts totaling P12.127 million that the PCGG entered in 2007 and 2009 with its sequestered company UCPB Leasing and Finance Corporation. The contracts were for ULFC's lease of its 11 service vehicles to PCGG. The ombudsman said both contracts were executed through negotiated procurement instead of public bidding required under Republic Act 9184 or the Government Procurement Reform Act. In its decision, the First Division said that aside from violating the government procurement rules, Sabio also caused undue injury to the government as the lease was “unnecessary” since the PCGG had enough usable service vehicles at that time. The court further noted that the lease of the ULFC vehicles was not included in the PCGG's “approved budget” for those years. The First Division affirmed its decision on August 25, 2017. In his petition, Sabio maintained that a resident auditor from the Commission on Audit had earlier found no irregularities in the questioned transactions. Sabio also reiterated that “it was a long standing practices of the PCGG to enter into a lease purchase agreement” and that he did not receive any personal gain from the lease deals. He also said that as then head of the PCGG, he was considered a member of the Cabinet of President Gloria Macapagal Arroyo, now Pampanga representative. Sabio said that as a Cabinet member, his act was also considered as the act of the President at time, who did not disapprove or reprobate the deals. “Due to the peculiar character and nature of its mandate and task, the PCGG is armed and vested with additional power and authority,” Sabio said. Sabio said these additional power and authority include making necessary representations on behalf of firms sequestered by the PCGG in various deals related to the agency's operations. Sabio is facing three counts of malversation of public funds before the Sandiganbayan Fifth Division in connection with his alleged failure to liquidate litigation-related cash advances in 2008 and 2009 amounting P632,428. He is also facing two counts of graft before the Sandigabayan Fourth Division over the supposed anomaly in the 2008 ownership row case between the Government Service Insurance System and the Manila Electric Company. The ombudsman, which filed the cases in December last year, said Sabio influenced his younger brother, then Court of Appeals Associate Justice Jose Sabio Jr. to rule in favor of the GSIS in a case filed by the Lopez-owned Meralco.